Alex Roland has worked in Somerset with people with learning disabilities for the last 15 years, working in both the private and public sector. He has a wide ranging knowledge of many of the pressing issues that face both the people he supports and Carers, especially in relation to computers and information technology. He has City and Guilds qualifications in care as well as up to date safeguarding qualifications and is fully DBS checked and insured. In 2010 he was a finalist for ‘The outstanding contribution award’ at the Care Focus awards ceremony. Alex demonstrated a powerful range of supportive approaches to connect people with learning disabilities to the wider community including local businesses, safe use of social media and breaking down barriers in the local community. Well done Alex!! 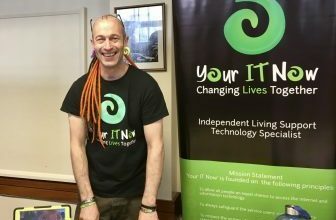 Alex is passionate about the involvement of people with Learning Disabilities in the wider community and this is why he has set up ‘Your IT Now’. Alex believes that we all have a valuable contribution to make to our local community and is a strong advocate of community participation and integration.